Effective expense management enables you to maximise your tax efficiencies and it needn’t be complicated or time consuming. This article will arm you with all the information you need to identify all the business expenses you should be claiming for and how to keep the relevant records. The HMRC rule is clear; a business expense must be necessary and that is wholly and exclusively incurred as part of the day to day running of your business. On the face of it, this definition appears simple, but what does it mean for you? Tax deductible – the majority of expenses fall into this group. These include business-related travel, IT equipment and services like accountancy and webhosting. Tax-deductible expenses are deducted from company profits so your tax bill is reduced. There’s more information on this type of expense later in the article, but you can find out more here in the full list of allowable expenses. Non-tax deductible – this type of expense is not deducted from year-end profits and therefore does not impact on the company tax bill. The most common example of this expense is client entertaining where you can still record them but it won’t reduce your tax bill and VAT can’t be recouped. “Is the item or service used purely for business?” This helps you ascertain whether a proportion of the cost needs to be deducted for personal use. Examples of this are: mobile phones in your own name but used for business calls too, home-office running costs, personal vehicles used for business. There is sometimes confusion about personal expenses and whilst some items appear obvious such as your weekly shop and clothes, others can appear to be in the grey area. Common queries are around company cars, gym membership and private healthcare for example. Expenses that have a dual purpose, i.e. business and personal will be classed as a benefit in kind, which means that there is no reduction in corporation tax, you can’t claim the VAT and you’ll need to pay income tax and National Insurance too: it just adds to your paperwork as you’ll need to file a P11D and there would be no financial gain. We advise not to put personal expenses through your company to avoid additional administration and income tax and NI payments. Many businesses have exposed themselves to scrutiny by HMRC by including personal expenses; they incurred penalties and additional administrative burdens. It can seem counterintuitive that claiming your business expenses will improve the financial health of your company as they eat into your company profits; but business expenses are deducted pre-tax and VAT, so in real terms, you’ll have more cash in your business and your pocket. It’s not just your financial health you are improving; business expenses form part of your evidence supporting your IR35 exemption status. Independent businesses by their very nature incur expenses and running costs. Marketing costs, professional fees and asset accumulation are all strong indicators that you are operating as a separate entity from your clients. For more information visit our guide to IR35. You log all the information about the expense including; date of the expense, total cost, VAT paid, type of expense, narrative where appropriate. How the expense was paid for – if the expense was paid for directly for the company this is the most efficient way of dealing with expenses. If the expense was paid for personally, this needs to be tracked to enable you to reimburse yourself either through your payslip or directly. Categorising the expense is important as this drives the amount of tax and VAT that is deductible as well as ensuring you apply the correct amount of VAT to the expense should you go on to charge it to the client. Receipts and other items of proof need to be retained for at least 6 years. This is how long HMRC asks for records to be kept. It is wise to keep both hard copies and electronic copies for ease of retrieval. Don’t let receipts and notes on expenses pile up. Deal with them daily or at least weekly. That way the information is fresh and you are less likely to lose the receipt. 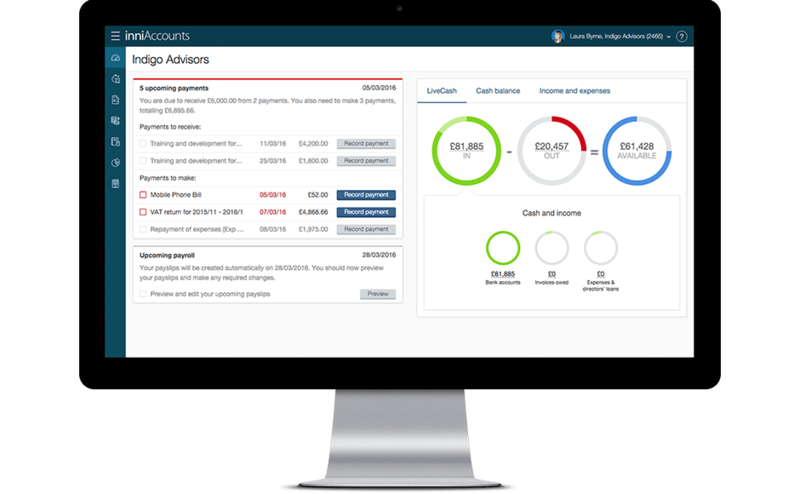 By tracking your expenses as they are incurred it will take you less time to reconcile your outgoings against your bank statements each month and you’ll have a true picture of how much available cash you have in your business. The inniAccounts software makes it easy to manage your receipts through the mobile app or on the desktop site. For more detail about record keeping, see part 3 in this series ‘Day to day management and record keeping’. Any equipment you purchase for the sole use of the business is fully tax deductible. It is worth noting that shared use of the equipment e.g. using your laptop as the family computer at weekends means it is not a deductible expense. Business equipment should be reserved for the sole use of the business. The majority of the equipment you purchase will be classed as an asset and needs to be entered onto your asset register as well as tracking the expense incurred. E.g. Will the item have a useful life of more than one year? And, does the item cost more than £200? If so it’s likely that the purchase is an asset, not an expense. Conversely, if not, it is likely the purchase is an expense. By entering your purchase on the Company Asset Register you effectively retain the real-time value of the asset within your business so it improves the value of your business. The value of your asset is automatically reduced over time – if you are an inniAccounts customer, we reduce the value of your asset by 25% each year, so after four years the accounting value of the asset will be zero. This is all handled automatically, so managing your asset register is easy. Consumables differ from equipment as they are not durable items. They are by their definition consumed by the company. They are typically purchased directly by the company for sole business use. E.g. These expenses are relatively simple to record as they are a basic expense of the business. The cost is apportioned to the business at the point of purchase and there is no long-term benefit to the business. Your business needs support from other professionals such as accountants, solicitors and tax consultants. Marketing your business is important and marketing expenses are one of the core expense areas that HMRC looks at in ascertaining whether you are working outside IR35. Ongoing marketing costs show you are actively investing in and promoting your business. E.g. While certain utilities will be solely business use (e.g. mobile phone contracts) others may have shared use if you work at home. It is important to only claim for the proportion used by the business. For more detailed information about how to calculate the proportion you can claim as a business expense, read our ‘Guide to claiming for home office expenses’. You need to be able to show evidence to support your calculations should HMRC question the amount you are claiming. E.g. As a part of your continued professional competence, HMRC recognises certain professional bodies and personal development tools such as business publications as a necessary business expense. It is important to ensure that the professional body subscription/membership fee is allowable by HMRC; check that the professional body is recognised by visiting HMRC’s recognised bodies list. It is important to note that lifetime membership fees are not an allowable expense. E.g. All insurance policies designed to protect your business interests are classed as a business expense. We’ve listed the most common business insurance categories below, but you’ll find a more complete list of insurances here. Travel expenses fall into two categories. The more straightforward is public transport – you simply claim for your fare and retain the receipt. Mileage involves a little more information gathering as your claim is based on the number of miles you travel rather than a flat cost. For any travel expense you need to be aware of the 2 year or 24 month rule regarding travel expenses. The 24 month or 2 year rule is set by HMRC. Travel and subsistence expenses can be claimed whilst working at a ‘temporary’ workplace such as a client’s site. After this the workplace is classed as permanent and travel expenses can longer be claimed. N.B.! The rule also states that as soon as you are aware that you will be at a workplace for more than 2 years you must stop claiming travel related expenses straightaway. For example, if you start with a 12 month contract and you secure another 12 month contract with that client, you must stop claiming expenses at 12 months. If you’re travelling to and from a temporary place of work (for example, to a client’s office) using your personal vehicle you can claim for the mileage. HMRC publish a fixed rate for mileage which you can claim without having to pay tax – for a car this is 45p per mile for the first 10,000 miles per year, and 25p per mile after this. The mileage allowance is designed to cover the car’s running costs and the fuel costs: you cannot claim for the fuel as well as mileage. If you make a 20-mile round trip to a client’s site 3 times per week you’d clock up 2,880 miles per year – that’s £1,296 towards the running costs of your car, tax free. What’s more, you can claim mileage for using your bike. Cycling to and from a client’s premises can soon add up too. When using these rates there will be no additional tax to pay – in the example above an extra £108.00 per month (£1,296/12) would be on the payslip with no extra tax or National Insurance deductions. inniAccounts customers can keep track of and be reimbursed for mileage claims quickly and simply. When you make an entry into your mileage log, the software keeps track of your miles to date for the tax year and applies the correct rate. When your payslip is created, any mileage that you need to be reimbursed for will automatically be added to your payslip. Business entertainment is a necessary expense for many businesses, but it is important to understand the different types of entertainment and how it impacts on your tax bill. Client entertaining is a valid business expense and can form a major part of business development for many companies. It is important to note that entertainment expenses do not reduce your corporation tax bill and you can’t reclaim the VAT back either. The inniAccounts system takes the rules for entertaining into account so all you need do is record the expense correctly. Simply select ‘entertainment’ as the expense category and we’ll do the rest to ensure that your corporation tax and VAT returns are accurate. The event must be an annual event and open to all employees. The £150 applies per person, and you can even claim for partners who don’t work for your company – so that’s £300 per couple. You can only claim for a maximum of £150 per person if you claim just 1p over this the whole amount becomes taxable. It’s not just for Christmas parties – the allowance applies to any annual event. You could even have a Christmas Party and a summer event too – as long as the combined total is £150 per head or less. Think of your business expense receipts as cash – they need to be held securely and recorded appropriately. By taking a few minutes each day to record your expenses accurately you are enhancing your business finances. You’ll know exactly how much cash is available in your business and minimise your tax liabilities all in one go. Audit all your outgoing expenses and ensure you are recording all of the allowable business expenses against your business. Ensure that the business expenses are wholly attributable to the business where possible and that any proportional expenses are realistic – err on the side of caution. Keep your records up to date and your auditable proof safe – track your expenses as you go and store the receipts in at least two places. Visit the knowledge hub for more advanced guides on business expenses.